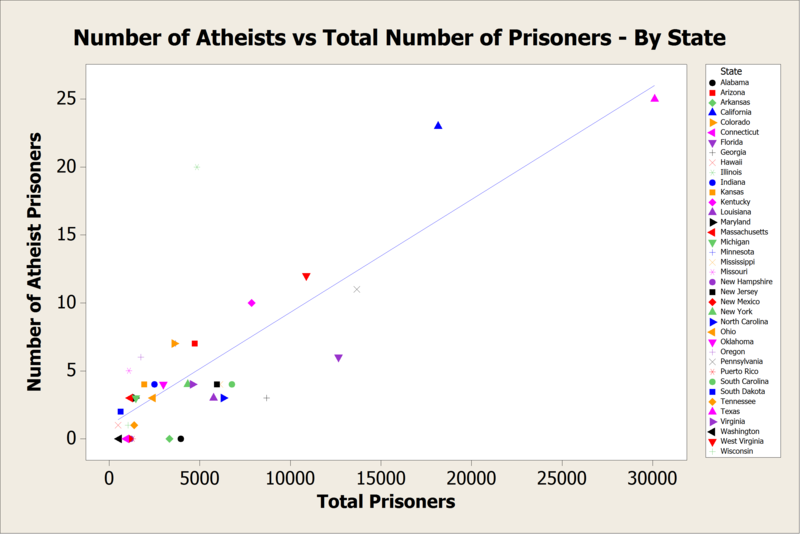 What Else Can We Learn from the Atheist Prison Data? This is a guest post by Geoff Zahn, a postdoctoral researcher at the University of Hawaii, Manoa. There are still some interesting questions regarding the FOIA data that Hemant acquired describing the self-reported religious preferences of federal prison populations. For starters, why is it that Texas has the most atheist prisoners? Can that really be explained by them simply having more federal prisons? Turns out: Yes, it’s a great explanation. In fact, we can test this statistically to see exactly how well one variable correlates with another. The blue line is known as a regression and is the statistical “best fit” equation that explains the relationship between our two variables. In this case the total number of prisoners in a state explains 64% of the variation we see. That’s a pretty large number as far as regressions go. What does this mean (in English)? It means that, as we might intuitively expect, states with larger numbers of atheist prisoners simply have more prisoners to begin with. But look closer and you might notice a couple of outliers — points on this chart that don’t sit close to our explanatory line. Illinois, for example, which is hiding in the upper left part of the chart, seems to have a disproportionately high number of atheists in prison considering their relatively low total number of prisoners. California (the blue triangle near the top) also seems to have a higher-than-normal number of atheists in prison. Let’s take a look. 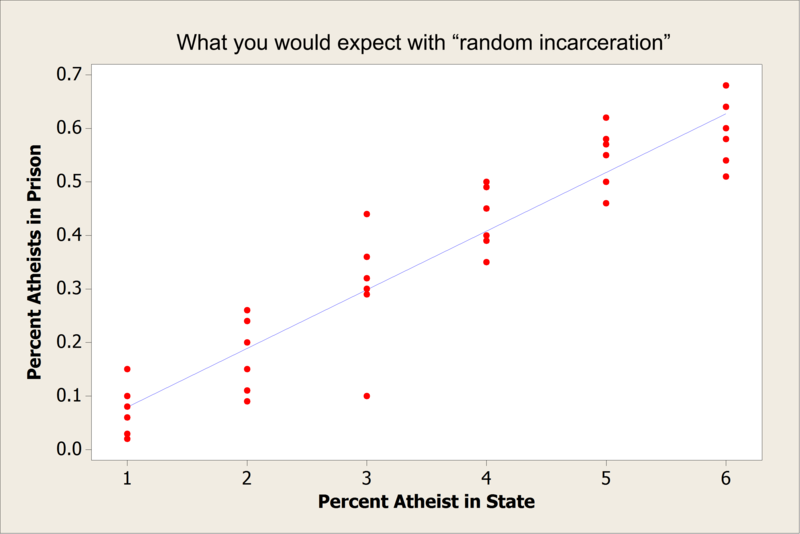 The chart below uses randomized data to simulate the scenario we would see if the percentage of atheist prisoners were perfectly correlated with the percentage of atheists in each state. The slope of this regression line serves as the hypothesis we will test in a minute using the actual FOIA data. Another way to look at this: If you were to randomly select citizens to throw into federal prison from each state, this is what you would expect to find… that the higher the percentage of atheists in a given state, the higher the percentage of atheists would be incarcerated in that state, just by random chance. 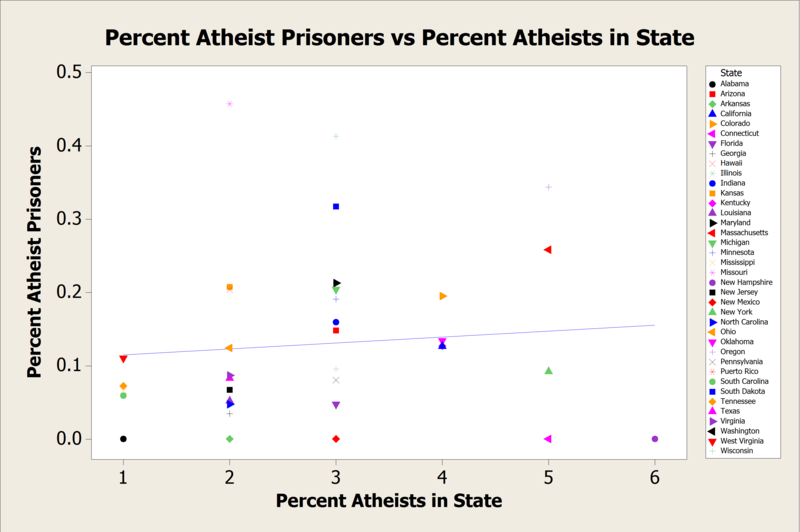 The points (each one representing a state with at least one federal prison) are clustered vertically because the information in the Pew database only lists whole percentage points for the proportion of atheists and many states share the same value. That’s the expected scenario if atheists were equally likely to end up in prison as everyone else. But here’s what we actually find: A statistically flat line with no discernible trend. Our data do not support the original hypothesis. Check out New Hampshire for the win (in the bottom right corner)! It turns out the state with the highest percentage of atheists has a whopping zero percent of them in the federal prison population. What’s more striking (other than Missouri’s disproportionately high showing in the upper left… boooo! *) is that our regression line only explains 0.9% of the relationship between these variables. That’s ridiculously low. It’s the statistical equivalent of saying that the percentage of atheists in a given state has absolutely no effect on how many atheists wind up in federal prison there. Increasing the prevalence of atheists in a state does not increase the prevalence of atheists in that state’s federal prisons. Or, to put it another way, increased irreligiosity has no bearing on the percentage of atheists in prison. You could sift through the data and do this for almost any religious group. I suspect you’d find roughly the same result: Being Buddhist or Mormon, for example, probably also has nothing to do with whether someone would end up in prison. Other factors are simply more important. This all may seem pretty intuitive to anyone who has spent time with non-believers, but our culture still seems to irrationally fear them (atheists, that is).